Artificial Intelligence, voice and digital assistants were all the buzz at ESOMAR Congress 2018. The promise is that when these technologies come together in digital personal assistants, they’ll make our lives easier, remove our “choice stress” and will become our trusted advisors. Sign me up! But, how will voice technology affect consumer behavior and how will brands tackle this new decision environment? Our recent voice trends research included qualitative interviews with digital and eCommerce experts on this very topic. 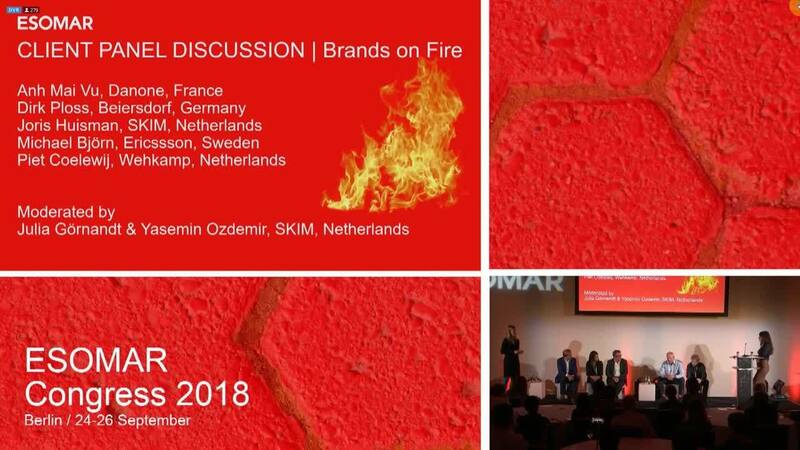 At ESOMAR, some of these respondents participated in our “Brands on Fire – How to adapt to the new market reality of AI platforms” panel. Danone, Wehkamp, Beiersdorf, Ericsson and SKIM had a lively discussion on the digital implications of AI for brands, marketers and insight professionals. I, along with Yasemin Ozdemir, had the honor to moderate the panel. Here’s what you missed and need to know. “Do you think Digital Assistants mark the end of marketing as we know it”? Brands will need to reinforce consumer loyalty and forge new direct relationships in order to influence purchasing behavior. Dirk Ploss, Digital Technologies Scouting and Advisory for Beiersdorf shared some of what the international skin care company is doing with voice and AI. “We have to educate the consumer to ask for Nivea and not skin care cream…and we have to market to the machine in order to get to the number one spot or number two spot when the machine gives its suggestions of what to buy,” said Ploss. looking at the impact of these new technologies. Joris Huisman, Managing Director of SKIM, shared that 40% have already trialed making a purchase via voice and 38% have are planning to purchase that way within the next six months. “I’ve not seen consumer trust so high with an appetite to use it while it is still in its earliest stage of development,” commented Huisman. “And our research shows young families are leading in the use of voice, so without a doubt, this technology is going mainstream,” he added. Click the image to see full infographic with highlights of SKIM Research "Voice Awareness & Usage in USA and Europe"
According to Joris Huisman of SKIM, brands should “double down on your investments on researching the voice experience and take advantage of the existing channel in your marketing.” He offered radio advertising examples in the US that encouraged consumers to “Ask Alexa about… or ask Google Home for” specific products. Want to explore how AI is changing the decision environment for your consumers? Please and we can discuss how insights can help you navigate this new area. As Country Manager Germany Julia is leading the new SKIM office in Berlin. She works closely with leading Consumer Health and FMCG clients in the DACH region to understand and influence buying decisions across all channels. Julia holds a MSc in Psychology from University of Tübingen, Germany. Prior to joining SKIM, she was a researcher at the Psychology Department of Stanford University, California.